Why should chromosomal abnormalities be screened in pregnancy? Chromosomal abnormalities are the main cause of perinatal mortality and disability in childhood. The only way to diagnose them is by the examination of the number and the structure of the chromosomes (karyotype) by taking a trophoblastic tissue sample (biopsy-CVS) or a fetal amniotic fluid sample (amniocentesis). However, because both methods are invasive and have a certain risk for miscarriage (1%), are applied to women at increased risk only. In the 1970s the screening of this risk was based on the mother’s age. In the 1980s in the 2nd trimester the maternal age, biochemical markers, and detailed ultrasound (genetic) of the fetus were used. 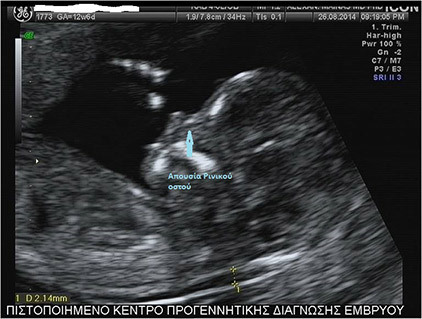 In the 1990s, the screening was directed toward the first trimester of pregnancy when it was observed that the majority of embryos with chromosomal abnormalities could be detected by measuring their neck thickness (nuchal translucency) and the measurement of two new biochemical markers (β-HCG , PAPP-A) in the mother’s blood. Over the past 10 years, additional ultrasound markers have been described that improve the sensitivity of the screening and reduce the false positive results and the number of pregnant women who will be unnecessarily submitted to an invasive test. It is known that, the risk of chromosomal abnormality increases, as the age of the mother increases whereas the chromosomal abnormal fetus has a greater risk of miscarriage than normal, with the progress of pregnancy. However, in the 1970s, the women over the age of 35 were 5% of the population and this group contained the 30% of fetuses with chromosomal abnormalities, whereas today the 20% of pregnant women are over the 35 years old and this group contains the 50% of the chromosomal abnormalities. Thus a policy of selection of the pregnant women in high risk based only on maternal age is incorrect as most of the pathological fetuses (35%) are in women under the age of 35, which was the cut off for an invasive test. In pregnancies with chromosomal abnormalities has been shown that the concentrations of various embryo-placental products are different compared to normal embryo pregnancies. The measurement of these products as known maternal biochemical markers in the second trimester increases the detection of fetuses with chromosomal abnormalities from 35%, when is using only the age to 60-65% when is using the AFP &β-HCG (double test) to 65-70% the uE3 (triple test) and to 70-75% the inhibin A (quadruple). However, in the last decade we made an attempt to incorporate the biochemical markers in the screening of the first trimester. In particular, we found that the beta-HCG in fetus with trisomy 21 was twice as high as in normal, whereas PAPP-A was the half in those with trisomy 21 compared to normal. Incorporation of the above markers increases the detection rate of abnormal chromosomal embryos by 30% based on age to 60-65%. In recent years, new placental products have been incorporated as PLGF which is lower in embryos with chromosomal abnormality and the AFP also. These new markers increase the sensitivity to 80%. In 1866 Langdon Down noticed that the skin of individuals with trisomy 21 was thicker than normal. 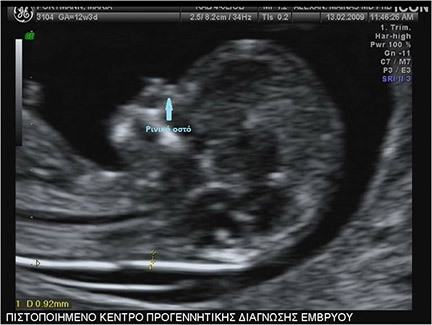 In 1992 Prof. K. Nicolaides discovered that this thickness can be observed by ultrasound in the 3rd month of pregnancy as accumulation of fluid in the neck of the fetus so called nuchal translucency. 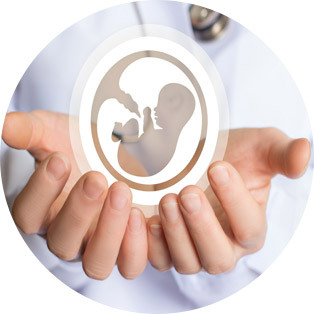 Over the last 20 years, extensive studies have been conducted where it has been shown that increased nuchal translucency is directly related to chromosomal abnormalities, cardiac defects and some fetal genetic syndromes. Thus its measurement is now applied to all pregnancies between 11-14 weeks according to certain protocol so that the result is reliable. Over the past two years, except the known nasal bone new ultrasound markers have been added to the above combination such as the ductus venosus flow and the regurgitation of the tricuspid valve of the fetal heart. 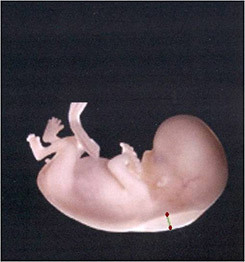 It is known that the pathological findings in the above markers are observed in fetuses with trisomy 21 at 60, 65, 55% respectively, while in normal embryos at 2.5, 3 and 1%. 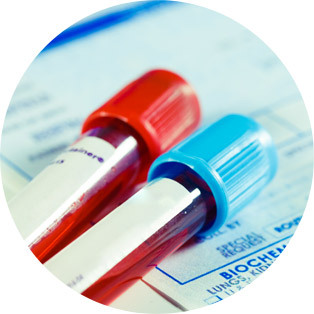 What will include chromosomal abnormality screening and when to do it? Measured by ultrasound the cervical length for the calculation of the risk of preterm delivery, and the maternal uterine arteries resistance for the risk of pre-eclampsia and the intrauterine growth retardation. When a pregnant woman has an increased risk for a chromosomal abnormality? According to the results of the above combined screening test, a pregnant woman is classified in a high risk group (1.4% of the total population) for a chromosomal abnormality if the probability that will occur is greater than 1/10. This group contains the 80% of fetuses with a chromosomal abnormality (80% trisomy 21 and 95% with trisomy 13 and 18) and must have an invasive test. If the risk (moderate) is between 1/10-1/1000 this group is found in the 25% of the population and contains the rest of 19% of chromosomal abnormalities and must be followed by an non-invasive prenatal test (cfDNA) in the mother’s blood .Finally in the low risk group (75% of the population) the mother must be reassured that her baby is normal and must be looking for the ultrasound markers of chromosomal abnormalities in the anomaly scan of the second trimester.